Sepang, June 1st-2nd 2016 – The International Shari’ah Research Academy for Islamic Finance (ISRA) has successfully organized the 10th Muzakarah Cendekiawan Shari’ah Nusantara (the Regional Shari’ah Scholar Dialogue). The theme of this year’s Muzakarah is Towards Strengthening Islamic Finance: Issues and Solutions. The presentations and discussions were conducted in Malay. 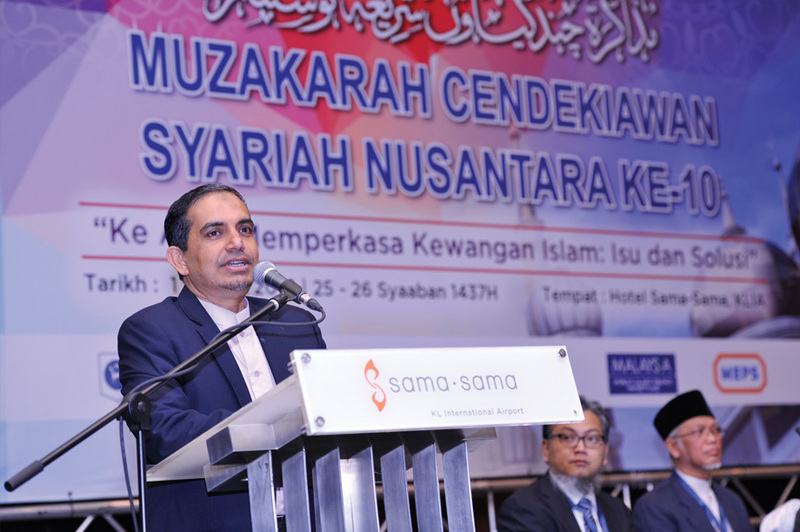 The main objective of the Muzakarah is to establish a common understanding among Shari’ah scholars in this region through academic discussions on various issues pertaining to Islamic finance. This event also aims to provide a regional platform for Shari’ah scholars and practitioners to exchange ideas, knowledge and experience, and to share the latest developments in the Islamic finance industry. The two-day event was officiated by Prof. Dr. Mohamad Akram Laldin, the Executive Director of ISRA. This event successfully attracted more than210 delegates comprising scholars, academician, and practitioners in Islamic financial institutions from countries in the ASEAN region such as Malaysia, Indonesia, Singapore, Thailand, Brunei and Cambodia. Representatives of Bank Negara Malaysia and Securities Commission Malaysia were also in attendance. In total, six (6) papers were presented. The first day of the event began with a presentation of the 9th Muzakarah resolutions by Mr. Cecep Maskanul Hakim (DSN-MUI-Indonesia). The first discussion session began with a presentation of a paper entitled Recheduling, Refinancing and Restructuring of Islamic Financing Facilities from The Shariah Perspective, by Assoc. Prof Dr. Aznan Hasan (IIUM-Malaysia). He provided an overview of the concept of restructuring and rescheduling of Islamic financial facilities. He also presented the current methodologies of refinancing, rescheduling and restructuring as applied in Islamic financial institutions from the Shari’ah point of view. The paper was discussed Prof Dr Ashraf Md Hashim (ISRA-Malaysia), Hj. Mohd Nasiruddin Mohd Kamaruddin (Standard Chartered Saadiq Berhad-Malaysia) and Ust. Mohd Kamal Mokhtar (Mahkamah Rayuan Syariah-Singapore). The second discussion session continued with a presentation of three papers which focused on the issue of Qalb al-Dayn. The presenters for this session were Mr. Muhamad Taufik Ridlo (DSN-MIU-Indonesia), Assoc Prof. Dr Azman Mohd Noor (IIUM-Malaysia) and Dr Zaharuddin bin Abd Rahman (IIUM-Malaysia). The discussants for this session were Asst Profesor Dr Zakariya Hama (Fatoni University-Thailand), Hjh Hanifah Hj Jenan (Bank Islam Brunei Darussalam Berhad-Brunei) and Ust Abdul Ghani Endut (CIMB Islamic-Malaysia). The second day started with two presentation focusing on the Shari’ah issues related to Ijarah products. The presenters for this session were Assoc Prof Dr. Asmadi Mohamed Naim (UUM-Malaysia) and Ustaz Mahbubi Ali (Indonesia). The discussants for this session were Prof. Dr. Engku Rabiah Adawiah binti Engku Ali (IIUM-Malaysia), Dr Md Nurdin Ngadimon (SC-Malaysia), Dr Akhratzaite Abdul Aziz (IIUM-Malaysia) and Mr. Cecep Maskanul Hakim (DSN-MUI-Indonesia). The Muzakarah ended with a presentation of the resolutions, in which it resolved that three (3) methodologies, namely maturity extension, haircut and renewal of ijarah contract by increasing the amount of rental, can be used for rescheduling and restructuring, meanwhile some other methodologies need further researches. The resolution also proposed further research to be conducted on some unresolved issues discussed it the Muzakarah. This final session was chaired by Ustaz Burhanuddin Lukman (ISRA-Malaysia).